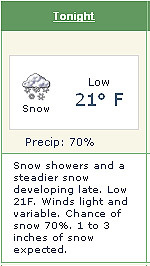 We've all heard the expression -- "When Hell Freezes Over..." and have rarely given it much thought. Yet apparently, many things would come out significantly different, if in fact Hell froze over. Like the raise that you requested that was met with the following response from your boss -- "You'll get a raise when Hell freezes over!" or the last time that you asked someone for a really, really important favor just to hear that your request hinged upon the ability of Hell to sustain freezing temperatures... Yes indeed, things could be much different if Hell would just freeze over. If you have found that pivotal moments of your life are contingent upon a freezing Hell then read on -- because as surpising as it may sound -- Hell does freeze over quite regularly. 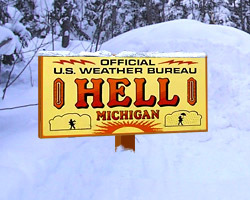 A while back, while looking at a map of Michigan, I stumbled upon a name, which quite clearly showed the location of Hell and not only proved its physical existence, but the fact that Hell also freezes over! It is a community in Michigan -- a state, which is quite well-known for its extremely cold winters -- winters that make everything "freeze." If you find that you will be going to Hell in the future, it would be wise to plan in advance. Please don't hesitate to click the link following the last picture below for a list of web resources concerning Hell. It's always better to be prepared when you are planning to go to Hell. 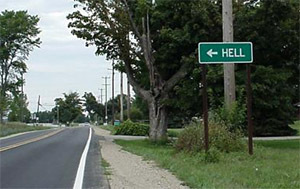 As I mentioned before, the route to Hell is clearly marked and just about anyone can find it easily. It is only a little over a half hour drive from Ann-arbor -- and according to Mapquest... you just make a final "left at Darwin Rd." I'm sure that some readers will find that very amusing. A Snowball's Chance In Hell! This is where things get pretty interesting. One of the most common dream-killing phrases in the American lexicon of overused clichés is -- "that's got as much chance as a snowball's chance in Hell!" This phrase can kill the aspirations, dreams and the hopes that many of us nurture... Well -- all is certainly not lost. Based on climatic data, snowballs actually have a very good chance in Hell. 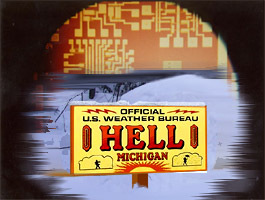 In fact during the winter, Hell seems to boast quite a significant snowfall. Click here for more about HELL.